I'm really loving ZARA at the moment, can you tell? I went in a couple of days ago and fell in love with everything from the recent range. It's all or nothing when it comes to me and shopping. I instantly wanted something in candy pastel and with a frill, preferably in blushed pink - everyone's favourite this season it seems. I couldn't resist and got the Metallic Detail Leather Cross Body Bag in pink. Probably the most Spring-like purchase I've ever made. I mean I might be hating the pale shades in make up but when it comes to wardrobe? Bring it on. That being said, this is the pinkest I would ever go. It's fairly small in size however it fits all my daily essentials, there's no need for another tote I say. 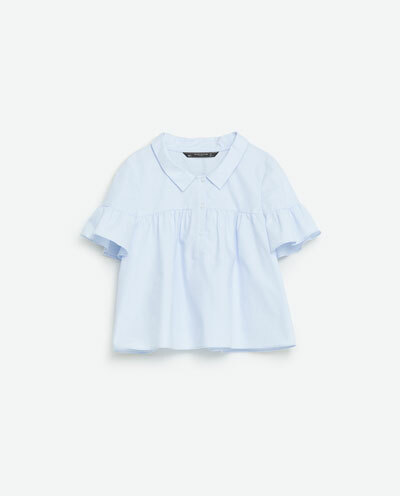 What else, I bought this Shirt with Contrasting Collar since the sun's been out here in the UK as the winter magically turned into summer within a day and I basically had nothing to wear to work. It's versatile, quite structured and adds a bit of colour into my wardrobe. I've not stopped wearing it since. Oh, remember the Whistles bag everybody loves/wears/owns that I had lusted over for a while? I got it and it makes me feel so chic I might as well wear it every day. Let me know what your favourite pieces are this season!